Jane Redmon began her study of Ikebana of the Sogetsu School in 1975 in a class sponsored by the Resident Associates of the Smithsonian Institution. She has studied continuously since that time, being certified as a teacher by the Sogetsu School in Tokyo, Japan, in 1978. From 1977-2006, she studied with Mary Sugiyama, Executive Director of the Sogetsu School in the United States. In 2001, she was awarded the Riji Diploma, the highest degree for a teacher, by Akane Teshigahara, Iemoto (Headmaster) of the Sogetsu School. Ms. Redmon was President of Washington, D.C., Chapter No. 1 of Ikebana International for a two-year term, 2007-2009. She has also served in other capacities for Ikebana International, including Recording Secretary and as Co-Chairman of the education programs at the Freer Gallery of Art to celebrate the Chapter’s 50th anniversary in 2007, and as the founding Chairman of the Evening Workshop. She was Director of the Washington, D.C., Area Branch of the Sogetsu School from 1996-2000. Ms. Redmon has taught classes in Sogetsu Ikebana for over 30 years, privately, and at the Smithsonian Associates, the World Bank, and the Library of Congress. 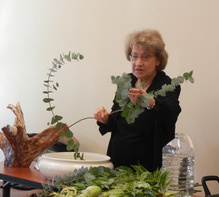 She has presented demonstrations to many ikebana groups and garden clubs, including the Ikebana International Chapters in Baltimore, Maryland; Naples, Florida; Dallas, Texas; Chinook, Montana; and the Washington, D. C. Chapter. She has participated in exhibitions in the Washington, D.C., area, as well as at the 1996 Ikebana International World Convention and at Sogetsu and Ikebana International conferences in the United States.